Preheat oven to 425°F and coat a 9" square baking dish with nonstick cooking spray. Cut potatoes in half. Place in a large bowl and set aside. Heat broth, parmesan, garlic salt, cheeses and artichoke hearts in a medium saucepan until cheeses are melted. Stir in spinach and cook until wilted. 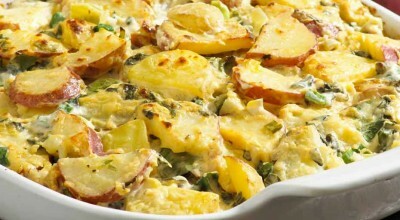 Stir mixture into potatoes with green onions, mixing well to coat potatoes as evenly as possible. Spread in prepared dish and bake for 30 minutes. Cover loosely with foil and reduce temperature to 375°F; cook for 1 hour more or until potatoes are tender when pierced with a fork.